Dr. Hussain graduated from Florida International University with a Bachelor of Science in Biology. He then went on to medical school at the Lake Erie College of Osteopathic Medicine in Bradenton, FL. He completed his residency training in internal medicine at St. John Macomb-Oakland Hospital in Warren, MI, and then came back down to Florida where he completed his nephrology fellowship at the University of South Florida in Tampa. 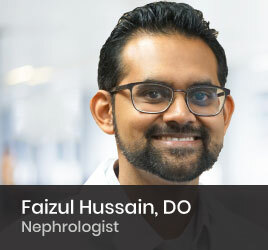 While there, Dr. Hussain served as chief nephrology fellow and was actively involved in the educating students and residents through formal didactic lectures and clinical rounds. Currently, Dr. Hussain is on staff at Broward General Medical Center where he continues to teach medical students and residents on a daily basis. He is also a member of the American Society of Nephrology and the National Kidney Foundation.